The words of Virgil (There are tears in things) lives in my heart, as mankind drifts into an amoral-corporatist world that the power elite has orchestrated. I think of those who expressed the populist sentiments that runs through 2,500 years of literature and the philosophy about man. Pause to think about the recent cultural history, think of those who struggled for a greater share of the products of their labor and of those who wrote about it. The owners of the means for the production of ideas have marginalized writers and singers who dreamed of social justice. I came from an era of hope, one culminating in the masses becoming an independent and poorly organized force for change. It died with the dreams of the Beatles because those who owned the production of ideas responded to the challenge to their power as the shadow government. The Powell Memo is a classic example of the power elite’s plans to respond to a Third Estate, (the commons) who were gaining in their political voice to build a just society. The supporters of the commons in the Fourth Estate (the press/media) ought not to be forgotten. For a taste of that era click on the embedded link and hear Edwin Markham read his poem Man with a Hoe. First published in the San Francisco Examiner on January 15, 1899, it became an international success having been translated into over 30 languages. 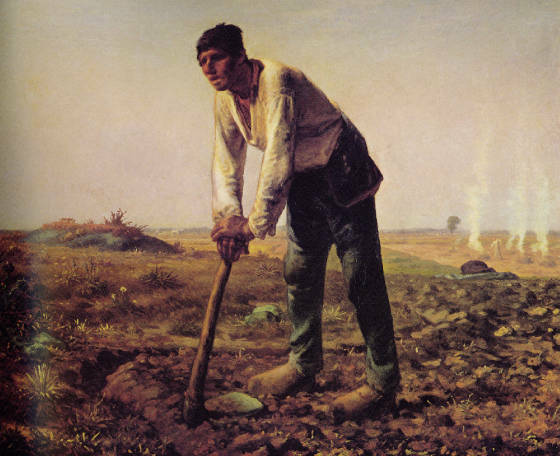 The poem was inspired by Jean-Francois Millet’s famous painting of the same name (above). “I soon realized that Millet puts before us no chance toiler, no mere man of the fields. No, this stunned and stolid peasant is the type of industrial oppression in all lands and in all labors. He might be a man with a needle in a New York sweat shop, a man with a pick in a West Virginia coal mine…. Markham's "The Man with a Hoe" was undoubtedly, with Longfellow's "Hiawatha," Lowell's "Old Ironsides," Whittier's "Snowbound," and Emerson's "Concord Hymn," among the most popular of nineteenth-century American poems. No American poem had as to its meaning so much public discussion. That was an era when everyone understood and had something to say about class society, racism, women’s rights, and the exploitation of labor. It was an era when workers united in unions to struggle for a living wage. It was an era when the corporate media was limited to print; its influence far less. Markham is one of many literary giants erased by our corporate media. Among my marginalized favorites are George Bernard Shaw, John Dos Passos, and Sinclair Lewis. More than 300 writers, actors, and directors were blacklisted from the Hollywood studies during the McCarthy era. A hundred years of the electronic corporate media by scrubbing its content has change the way the third estate thinks; and my heart feels the meaning of Virgil: “there are tears for things” (Sunt lacrimae rerum). For more on the lost generation of writers read Cary Nelson, Revolutionary Memory: Recovering the Poetry of the American Left. Copyright 2001 by Routledge. The Man under the Stone appeared at the top of the first page in the official AFL monthly magazine, the American Federationist, for July 1899. "The Man With the Hoe" also crystallizes a hundred years of American labor protest poetry and song and finally takes much of its message to a broad national audience. Markham no doubt knew some of that tradition, at least John Greenleaf Whittier's 1850 Songs of Labor and Other Poems if perhaps not more ephemeral texts like John McIlvaine's 1799 broadside poem "Address to the Journeymen Cordwainers L.B. of Philadelphia"; "Cordwainers! Arouse! “The time has come / When our rights should be fully protected.” But the tradition in America had long been persistently dual: professional writers taking up labor issues and agitating in verse for decent wages and working conditions and working people themselves producing their own rousing songs and poems. Philip Foner's marvelous 1975 American Labor Songs of the Nineteenth Century is the most comprehensive collection. While the painting was the decisive stimulus for the poem, Markham also clearly had in mind the great American labor struggles of the preceding decades, notably the coal strikes of the 1860s and 70s, the rail strikes of the 1870s, 80s, and 90s, and such historic events as the Haymarket massacre of 1886 and the Homestead, Pennsylvania, strike of steel and iron workers in 1892. Markham had himself been a farm laborer and had herded sheep as a young boy, so he also had some direct knowledge of the sort of work he was describing. The poem is effective in marshalling moral outrage and linking it to literariness on workers' behalf. Its indictment of the ravages wrought by those in power was decisive for its time, in part because Markham treated exploitation as a violation of God's will. The poem is equally successful at issuing a broad revolutionary warning to capitalists and politicians.